· The 5 components of the perfect thank-you note. · How to keep track of who gave what (and why you need to hang onto the list even after the thank-you notes are sent). · How to respond to special situations like a group gift, an absent relative, or a late thank-you. · Model thank-you notes for more than 85 common wedding gifts—from antiques to waffle irons! The model letters can be used as they are, altered to fit individual needs, or referred to as examples. 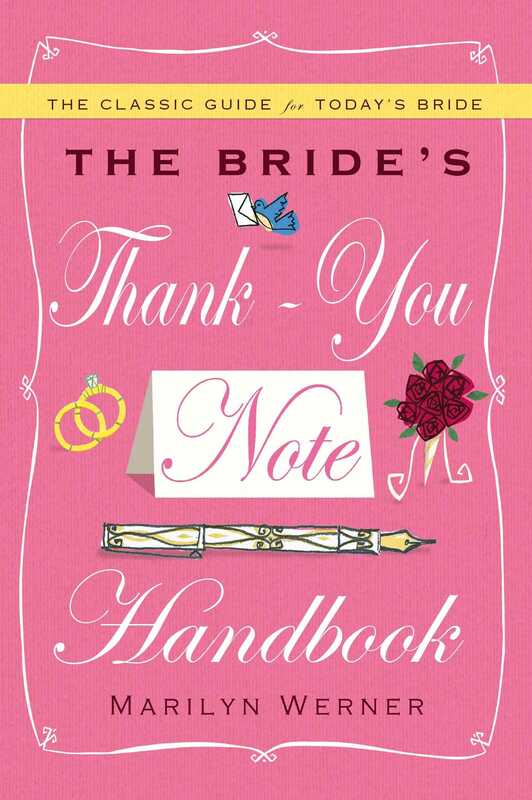 Werner offers not only an effortless, entertaining, and knowing course in etiquette, she also provides the new bride with what is perhaps the very best gift of all -- a super time-saving aid during a very busy and exciting period in her life. Try to establish some kind of routine for writing your thank-you notes. Set aside a specific time each day for this purpose, and within that period try to write at least four or live so they don't pile up. Reserve a particular place to write your thank-you notes; a place where you are not apt to be disturbed or distracted. Keep your gift cards, stationery, gift lists, pen, dictionary, and stamps at that spot. Save the gift cards that are enclosed with the gifts. After you have read them keep them together in a box, or bound securely with a rubber band. When you write your notes, refer to these gift cards, for they often express lovely and touching sentiments that are as worthy of acknowledgment as the gifts themselves. Thank-you notes should always be hand-written on good quality stationery. Plain folded note paper in white or ecru is most popular, but pastel shades, with simple borders or lined envelopes are acceptable. The bride's monogram, either engraved or printed, may be used for notes written after the wedding date. The appearance of your thank-you note is important, so use your best handwriting. Leave some margin on both sides of the paper, and see to it that there is as much blank space at the top of the paper as there is at the bottom. If the note is badly smudged or if you have crossed out a word, it is better to rewrite the note. When you have finished your note, read it aloud to make sure that you have not omitted or misspelled any words. This is the surest way of catching and correcting any careless errors. When mailing your thank-you notes insert the note in the envelope so that when it is removed the writing will be right-side-up and can be read without inverting the paper. Moisten, do not tuck in, the flap of the envelope. A thank-you note consists of four parts: a salutation, a body, a complimentary closing, and a signature. The date is included above the salutation in the upper right-hand corner of the paper. The salutation usually begins with "Dear" and always ends with a comma (not a colon). When the gift is sent by a married couple the thank-you note may be addressed to either "Mr. and Mrs." or to the wife only. In the latter case, however, you should make sure to mention the husband within the body of the note. You may wonder how to address the groom's relatives, some of whom you may not even have met. Although you may feel inclined to address them as Mr. and Mrs., you should remember that they are now (or are going to be) your relatives too. They should, therefore, be addressed, for instance, as Aunt and Uncle. In most cases, you will probably see them at some later date and call them Aunt and Uncle anyhow. The body is the main portion of the note, in which you will convey your thanks. Try to make your note as personal and individual as possible. You can do this by mentioning the gift by name and by saying something about its usefulness or appearance. If the gift is a check, describe how you have used it (or plan to use it) or what you have purchased with it. Sometimes, too, you will want to say something to the effect that you are looking forward to seeing the people in your new home, where the gift they have given you will occupy a very special place. Do not confuse enthusiasm with over-effusiveness, or warm feeling with over-sentimentality. Expressions like "heartfelt thanks," "forever and ever," "the most tremendous," and "in seventh heaven" should be avoided. Warmth of feeling and enthusiasm can be expressed in fresher and usually more restrained ways. Note the differences in the following three notes. The last one is clearly the best because it is the warmest and most personal. Thank you so much for your beautiful gift. We appreciate it. Thank you so much for your beautiful linen set. We will be the envy of all our friends when we invite them to dinner. We appreciate it very much. Thank you so much for your linen set. It is so beautiful that we plan to use it only on special occasions, one of which will be an evening with you -- we hope in the near future. The complimentary closing will depend on your relationship with the people to whom you are writing. With close friends and relatives, "love," fondly," affectionately" are quite acceptable. When the ties are not so close, you might choose to close with "sincerely" or "gratefully." "Sincerely yours" and "yours truly" area bit too formal. The signature consists of the bride's name only, never that of both the bride and the groom. If your note is addressed to people who have always known you by your first name, sign your first name only. To people who do not know you well, sign with your maiden name (e. g. Marilyn Maiden Name) before the wedding and with your married name (e. g. Marilyn Married Name) after the wedding. In cases where a more explicit identification is necessary, you may use your maiden and married names (e. g. Marilyn [Maiden] Married Name), hut only after the wedding. First, you may acknowledge the gift verbally by calling to thank the person who has given it to you or by thanking him in person. If the giver is your fiancé's (or husband's) friend, your fiancé may convey your thanks, adding that you plan to send a note in the near future. If the person is a friend of your parents or in-laws, they may say that you have received the gift and intend to send a personal note shortly. of thanks as soon as she is able. There are two disadvantages to this procedure. It is, of course, an extra expense, and it seems to suggest a really special personal thank-you note to come. A few short lines at the outset can save lots of time and effort in the end. It should be emphasized that oral thank-yous and printed acknowledgments are no substitutes for a handwritten thank-you note. Their only purpose is to provide the time for you to write the thank-you note and to give immediate assurance to the givers that their presents have not gone astray. Don't trust to your memory to help you keep track of all the gifts you have received and the people who have given them to you. Before you know it, you'll be playing the frustrating and time-consuming game called "Who gave me what?" The surest way to remember who gave you what is to keep lists. They should be kept in a notebook or on a pad, not on little scraps of paper that are easily lost. The first list will be for gifts received from your side of the family. The second list is for gifts received from the groom's side. When this list has been completed, your mother-in-law will appreciate a copy so she will know what gifts you have received from her friends and family. She may use this list (as you may too) as a reference if she has to send a gift in the future. A written thank-you note does not pledge you to a conspiracy of silence when you see the people who have given you a gift. You and the groom should thank the people in person when you see them. If they are guests at your home, try to use their gift or display it. Marilyn Werner is a writer who lives in New York.